We are now offering group tours. We meet you at your hotel with bikes and ride from there. Currently we are offering this service in Newport, Yachats, Otter Rock, and Lincoln City. All guided tours have a 4 person minimum. Prices listed are good for 2018. All tours will have a local, professional guide who will fit you to the proper bike and helmet (helmet only required for 1 years and under but recommended for everyone) and be well versed in the sights and stories of the area. Reservations are necessary and can be made by calling (541) 265-9917. We are also able to customize any tour specifically for your group, give us a call and we can find the perfect mileage, difficulty, scenery, and side adventures for you. Basic Fat Bike Rentals: Pick up a bike from the shop and ride on your own. We fit you for proper bike and helmet and give you information and directions on where to ride. $20 an hour and $50 for the day per bike. We have a variety of sizes to accommodate most people. This ride begins and ends at the bike shop. Will ride through the quaint village of Nye Beach onto the sand & towards the Yaquina Head Lighthouse and then to the North Jetty and the Yaquina Bay Lighthouse. Approximate ride time is 1.25 hours. Easy, flat ride w/ a short moderate hill on the return to bike shop. Base price for 4 people is $200. Each additional person is $25 per person. 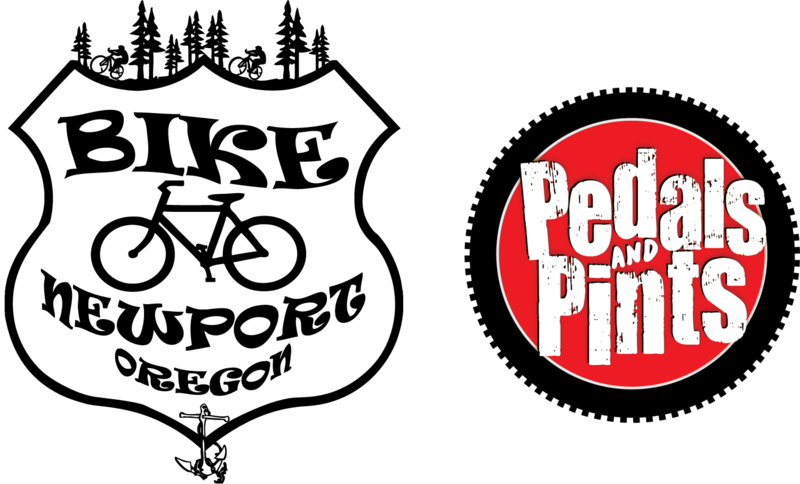 *Add on a pint at the finish of ride at the “Pedals & Pints Tap House” inside the bike shop for $5 per person! 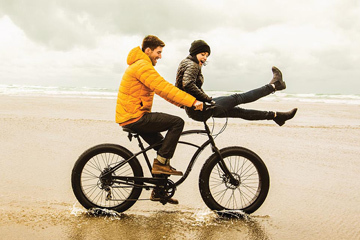 This ride follows the beach South through Tide Pools, waterfalls, creeks, bridges, and towns on its way to the quintessential coastal town of Yachats. Approximate ride time is 4 hours min. Mostly flat, some hills, a few spots on the roadway to cross bridges, etc. Need to have some cycling experience and have endurance to ride consistently for 4+ hours. Base price for 4 people is $375. Each additional person is $35 per person. This ride begins in the cute hamlet of Otter Rock. We will ride flat beach amongst the surfers and whales towards the Yaquina Head Lighthouse. We will then enjoy a tour and tastings at the Flying Dutchman Winery that hangs over the cliffs at Devil’s Punchbowl. Flying Dutchman has arguably the best view of any winery & the “salt air fermentation” makes their wines superb and a must stop on any Coastal tour. Base price for 4 people is $300. Each additional person is $35 per person. This ride follows the flat beach South past surfers, kiteboarders, a waterfall & creeks. We will then enjoy a tour of the Rogue Brewery and tastings of their renowned Oregon beer. Kick back in their pub with a view of the Yaquina Bridge, sailboats, and commercial crabbing vessels and enjoy a well deserved pint after your pedal! Reserve a group of four ride in Newport, OR for $150/hr. Reserve a group of four ride in Otter Rock, OR for $175/hr. Reserve a group of four ride in Yachats, OR for $200/hr. Reserve a group of four ride in Lincoln City, OR for $225/hr. Ready to reserve your fat bike? Give us a call or stop on by the shop and start your adventure on the beach today!